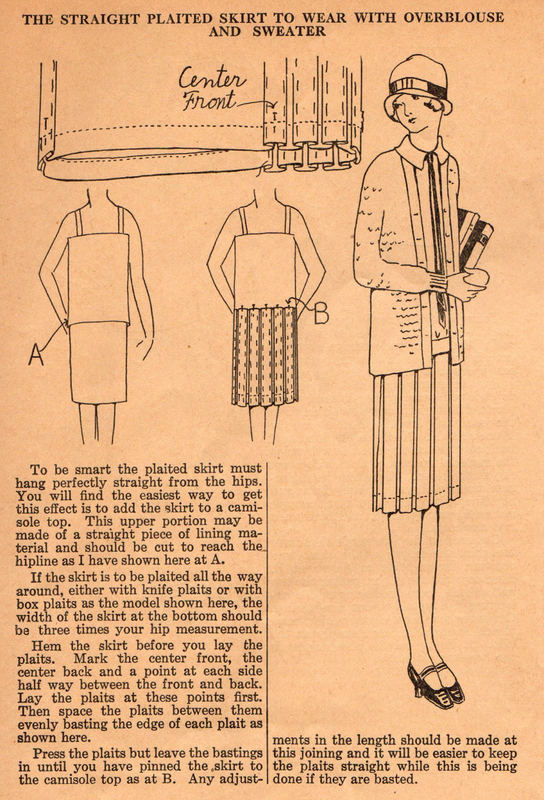 Delivering "preppy" style, this tip from Ruth Wyeth Spears and the 1920s describes how to create a box-pleated skirt that is attached to a camisole. The skirt is intended to be worn with an overblouse and a sweater. Note the rule of three times your hip measurement for determining the width of the fabric for the skirt. I love the tip of hemming the skirt before pleating, and then adjusting the length where the skirt joins the camisole (rather than in the hemline). I just love Ruth's tips. Enjoy! Oh! And refer to my post on sewing a 1920s tunic dress foundation garment for a better understanding of the garment construction in this tip.